So my usual info about the breakfasts and I have to advise that the King Arthur’s Arms Inn breakfast was average, what made it worse though was that they didn’t start until 9am, and for walkers, OK for us when we are walking that is too late. It did make us feel that we were under pressure, as the section from Tintagel to Port Isaac is graded as ‘severe’ and at around 9 miles, the fact that we were being picked up at 4:30 gave us the concern we would have to rush. As it happens we were fine, but I’d have preferred if the King Arthur had served a little earlier. Walking out for our last and eating as I mentioned a little later meant a 10am start, we retraced to where we had finished yesterday and headed south. The walk overall was pretty uneventful, we met with a couple of walkers whom we’d kept passing yesterday, so of course we chatted and compared notes,as walkers on the path tend to do. Having said that the walk was uneventful this doesn’t describe the 199 steps that we had to climb at Trebarwith Strand, and then the following, it must have been 6 or seven valley downs and ups we encountered. However these often mean a change of scenery and some great views. After climbing out of Trebarwith Strand you can pretty much forget looking for a Cafe, Tea Room or any other refreshment stop until Port Gaverne, by which time you are almost in Port Isaac. The tide was in for most of the walk so the beaches where we thought we may have had another opportunity to swim we not accessible, next time. We arrived in Port Isaac with time to spare, and found our way over to the Chapel Cafe where all sorts of paraphernalia could be bought, but it was also a cafe, some very nice homemade cake and tea was partaken of. We headed to the pickup point and was driven back to Hartland Quay where we drank some Wreckers and had some food. Yes we are already planning the next section as yet again we enjoyed the experience so very much. 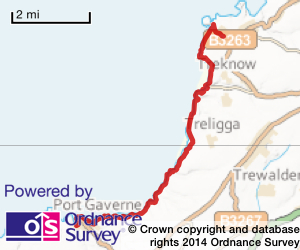 12.93 miles Distance, including extra walks to beaches and to the ends of any points we visited. Total time out including stops photo opportunity, enjoying tea and cake, 6 hours 30 mins. Total this week 32 hours 11 mins. Total walk time out 131 hours 39 mins. An extra piece of info from my Fitbit total Steps = 30506 including extra walks to beaches and to the ends of any points we visited.